RoboCamp gives interested students a taste of what it's like to be on an FTC robotics team, and a taste of the different team roles. By the end of the half day, interested students should have a pretty good idea whether they'd like to join the team, and if so, what role they'd prefer. RoboCamp isn't actual training. The lessons are real, and are nice tutorials for later, but it's important that students be told not to worry about retaining anything or writing anything down. It is also NOT tryouts for the team or specific roles! They should relax and enjoy their first robotics experience and start developing bonds with the veteran team members and each other. We let the students know that RoboCamp is to help them decide if they want to be on the team and which role they'd prefer. So far, allowing team members to choose their roles and commitment level has generally worked out for us without drama..
We hold RoboCamp on a Saturday a few weeks before the start of the school year. It is key to get the new kids before they start joining up for sports or clubs. This way they can plan their level of commitment to their afterschool activities. Prepare flyers and get it included in summer announcements or school newsletters. Incoming freshen and their parents tend to be pretty attentive to these things before their first year of high school. Identify the veteran students that are going to lead the stations, and have them practice on someone. 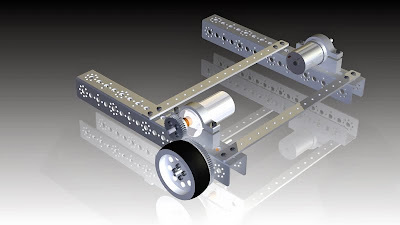 Build your small Mindstorms robot for programming. Get together any animations, videos, photos, etc. you'd like to show for introductions and brainstorming. Get any programs and files required for CAD and programming on your computers. Have your building instructor pre-build a robot and save the parts in one box and tools required to assemble it in another. Create signs with arrows that point the way to your venue. Figure out how you're going to handle lunch (we buy pizza for everyone). The inevitable distribution of arrival times allows earlier kids a chance to drive last year's robots around. Later arrivals are captivated by this when they arrive. It removes awkwardness and gets the team mixing from the start. Kids should sign into the contact sheet as soon as they arrive. This is a good time to move Mindstorms bricks from last year's robots into your LEGO robots for RoboCamp programming. Start by making a big circle including veterans and coaches. Have everyone say their name, their year, something about themselves, and their favorite kind of pizza. The latter, was an easy icebreaker for shy kids and got our lunch ordering figured out. Have everyone raise their hands if they've not signed into the contact sheet. Mention any minimum hour commitments. Describe what's going to be happening during RoboCamp. Emphasize that this is not a tryout, and it's for their benefit to help them decide if they want to be on the team, and if so, which roles they'd prefer. Let them know that they'll be ranking their preferences at the end of the day. Divide the new kids up into 4 groups, and send them to their first stations. Our first year we had kids build the ORTOP sample robots, but it took all 4 sessions to get it built, so we decided this year to build the sample that comes with the Tetrix base set materials. Most teams probably have these instructions. It's relatively easy to get to the level of progress shown above, while taking the time to cover safety and good building practices. As mentioned in preparation, pre-build the robot and put the parts in a dedicated box and the tools required to build it in a separate box and set them aside for RoboCamp day. We found it easiest to run a 1 hour lesson on the basic sample robot that comes in the Mindstorms kit. We only built the robots up to Step __. The programs they will use they will create from scratch, but cut and paste some code in from the attached tutorial. This CAD tutorial was meant to mirror the ORTOP sample robot building session, allowing kids to build the same thing physically and virtually. We've since switched to physically building the sample robot from the Tetrix binder that comes with the Base Set, but haven't changed over the CAD tutorial.